A former Conservative county councillor representing Ramsgate who admitted making social media posts branded as Islamophobic is listed as standing in the district council elections as an Independent candidate. 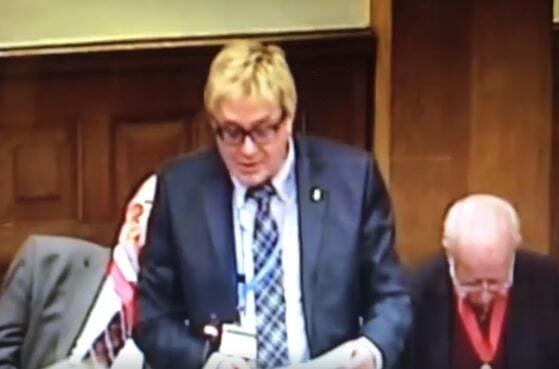 Cllr Messenger has confirmed he resigned from the Conservative Party on April 1. Initially Cllr Messenger said he “expressly denied” writing the posts but later he made a U Turn and admitted they were his. He issued an apology however there were calls for his expulsion from the Tory party and he was publicly condemned by Conservative county council leader Paul Carter. Cllr Messenger remains at county council as an Independent. He said: “I’m standing as an independent in Sir Moses Montefiore Ward because I believe I have duty to my constituents to put forward real Conservative principles and to promote open and honest local government. “I do not believe hard-earned taxpayers money should ever be squandered on loss-making activities or that the public purse should ever be used to subsidise enterprises which are plainly commercially unviable. But, instead of looking at all options for the port to find a sensible and credible way to stem the projected losses, TDC is about to commit itself to subsidising another loss-making enterprise at enormous cost to the council taxpayers of this district. “To date I have been thwarted in my attempts to promote the MDL ltd option and as an elected Independent member I will pursue this development opportunity with vigour. The industrialisation of the port makes no commercial sense and will damage tourism in the area forever. “It would also rule out all hope of a Maritime Village Development. More importantly, this proposal would “future proof” losses on the port for years to come and result in further, avoidable £3 million cuts to TDC core services by 2023. “So, with a heavy heart I resigned from the Conservative Party as I believe I have a duty to fight these financially crazy proposals in any way I can. Not least because I believe the first question any councillor should ask is this : does this proposed business deal pass diligence and compliance and will it benefit my constituents? “Unfortunately, TDC still seems to think this is the last question anyone should ask. Turning specifically to the ward of Sir Moses Montefiore, I want to ensure King George VI Park has better TDC maintenance than it enjoys at the moment. I want to ensure Dumpton area in general receives its fair share of highways issues. “I want look at speeding incidents along Dumpton Park Drive and see what can be done to encourage safer driving speeds there. Road and path cleanliness in Dumpton needs better TDC attention. He is a clown, but not funny! One wonders, who whistle blew on him??? his own Party or Labour? The Conservatives have wanted to get rid of him for a while, especially Cllr. Bob Bayford the TDC Leader. He had become an embarrassment! Has the man no morals at all? Typical Tory by all means. Just turn up as an Independant like all the other Tories that have jumped ship. But it is still you Mr Messenger!!! So having spent the last few years acting as the mouthpiece for Riveroak in KCC and working towards bringing untold damage to Ramsgate with cargo planes flying overhead every 10-15mins at 500ft, he now wants us to elect him as our councillor? Is this a joke? What else has he done for Ramsgate? Or anyone, (except himself)? The man is a laughing stock and, frankly, I’m sick of seeing him pop up anytime there’s a camera in town. He’s an embarrassment to himself and he gives Thanet a bad name . Tories don’t want him. We don’t want him either. Go back that bit-part in some long-forgotten, 1990’s Fast Show sketch you clearly came from, Mr “PJM One Love”. Here! Here! The Conservatives have wanted to get rid of him for a while, especially Cllr. Bob Bayford the TDC Leader. He had become an embarrassment! No, this guy , cosying up to RSP and not able to have an open mind and supporting taking someone’s land against their wishes is deplorable . No way should he be elected and speak for our area for any party. Messenger get the message we do not want you! Has this man no shame and the stigma he is putting on his wife is I believe untenable. Messenger was the favourite ‘blue eyed boy’ of the South Thanet Conservative Association Chairwoman (Lynne Connolly) until his vile racist comments became public. He and his cohort Martin Wise (former TDC Deputy Leader) who is of a similar ilk, have no place in local politics. He had hoped to replace Cllr Bob Bayford as TDC Leader. He also boasted that he hoped to be selected as Conservative PPC for South Thanet in the event of Craig Mackinlay having to stand down as a result of his expenses trial. Messenger got too big for his boots and my money would be on it being the Conservatives who brought him down as he had become an embarrassment to them, appearing on TV calling for the sacking of Chris Grayling etc. Aided and abetted by the eccentric former Ukip turned Conservative Cllr. Beverly Martin (Central Harbour Ward). Messenger obviously has no shame! He also has no chance of being elected, his dishonourable political career is over! Definitely an insider, are you the Broadstairs Resident who suggested the discredited former member of the National Front join the Conservative Party? Or are you one of the useless hanger-on Conservative councillors who say little, and do even less for the people of Thanet? Martin Wise I believe you are the short-sighted fool who not so long ago described Paul Messenger as ‘a visionary’ and a future TDC Leader to anyone who would listen. Another favourite theme of yours is to tell us that Sandy Ezekiel was a wonderful TDC Leader and what a great council TDC was under his leadership…until he was convicted of 4 counts of dishonesty and jailed! You are very out of touch and have very little grip on reality! Thankfully Bob Bayford soon clipped your wings and ensured you could not stand for election! Cllr. Doormat, knowing much about certain people as I do I would be careful about making adverse comments about Paul Messenger. Who by the way has more vision, drive, ambition and energy in his little finger than the whole of you and most of your Conservative colleagues put together. It is you who are the phoney and lazy frauds, because you have nothing to offer. Your useless and pathetic performance at meetings exemplifies all. And by the way, just how many South Thanet Conservatives bothered to make a representation to PINS for the Manston DCO. Answer NIL. So don’t give me “working hard for Thanet”. As for Sandy, he paid the price, but his record of achievements during his tenure speaks for itself, unlike that of you and 28 year councillor Bayford. So I am proud to have been part of his administration, but am ashamed to have been associated with yours because you are incapable of achieving ANYTHING through your own efforts. And yes, when I told Bayford I would stand against him because I was disgusted with his lack of ambition, he did indeed make sure I was not approved. My last words to him before he stormed off like a petulant child (which was a regular occurrence) were “You don’t give a monkeys about the people of Thanet, you just want to be Leader because you want to be Leader”. A bit like a banana republic in a 3rd world state? Should we start calling him General Bayford? And do I expect a knock on my door in the middle of the night? “Clip my wings” because I believe I could do better. Are you serious??!! And why not publish your name? Your moral cowardice on display yet again. Martin Wise you are a ‘has been’ with nothing to contribute to modern day politics. Both you and the egocentric Paul Messenger are finished and have no future in politics. Your big mistake was to attack Bob Bayford before getting elected to TDC, which could have happened had you both played your cards right. As soon as he became aware of your intentions Bob Bayford made sure neither of you had a chance of being approved as Conservative candidates. He is much too clever for you! Messenger tried to circumnavigate this by standing in North Thanet, only to be exposed as a vile racist. Now you are both finished! Yes, Bob Bayford has well and truly clipped your wings! You, Messenger and the eccentric Beverly Martin were all ‘useful idiots’ to Steve Coombes of RAG. I will put money on Messenger losing at the TDC election on 2nd May. Do us all a favour and crawl back into the nearest sewer! Well done Bob Bayford, he’s stitched you both up! Tied you both in knots due to your own stupidity! The residents of Thanet deserve better than you and your racist side-kick Messenger! Cllr. Doormat, so I deserve to have my wings clipped and the people don’t deserve me because I want better street cleaning, more flowers and public art, restoration of our heritage infrastructure, toilets, less graffiti, Manston airport, a maritime village, etc., etc.. And are better off with you and Bayford even though you have never shown any drive, desire or ambition to do anything about these other than acquiesce to the whims of TDC officers, rather than do what you can to defend the needs of residents? And because I am outraged by your failure to recognise that the port was taking c£2m out of the Revenue budget each year and away from services? I am sure your residents will vote for you on May 2nd, but only because of your blue badge, and not because of your personal qualities, achievements and commitment to them over the past however many years. And who was it that told me you are proud of not having much contact with your residents? Bayford. And who has little regard for your political nous and uses you as his useful idiot because he knows of all the Group you are least likely to command the support in any challenge to his leadership because you are an insignificant and useless little toadie? Bayford. So yes, I am a has-been who reluctantly chose to come back and genuinely try to make things better because I was disgusted with the self-serving, weak but power hungry local Conservatives who shame us all. But I would much rather be a has-been who enthusiastically tried, rather than a useless hanger-on with nothing to offer like you. No ideas, no integrity, no moral courage even to state your name. Welcome to the world of modern day local Conservatives. Why is he so desperate to be a councillor? Doesn’t he have a proper job? We need to purge Thanet District Council of elderly out-of-touch Tories at the local election on 2nd May. The same goes for Ukip and their off-shoot UK Independent group with their broken election promises. Let’s clear the decks of Tories & Ukip on 2nd May and bring in some new, younger blood with energy and ideas for Thanet. VOTE FOR CHANGE ON 2ND MAY! So fearful are the Tories of losing control in the TDC election on 2nd May that they are resorting to underhand methods in an attempt to skew the election. Latest news is that in Beacon Road ward the polling station in the poorer part of the ward has been closed, this is the part of the ward where there are more Labour votes. This leaves only the polling station at St Andew’s Church in Reading Street, in the more affluent area with more Conservative votes. Shame on you TDC Leader Bob Bayford! Tory austerity measures are tearing our country apart, starving the NHS and schools of funding and creating homelessness on our streets. It’s time for change! We need to purge Thanet District Council of Tories!